Are more efficient irrigation systems good for farmers and the rest of society? This is a question that may receive a straight “yes” from many of our readers. However, agro-hydrologists and others know that there’s more to the discussion. 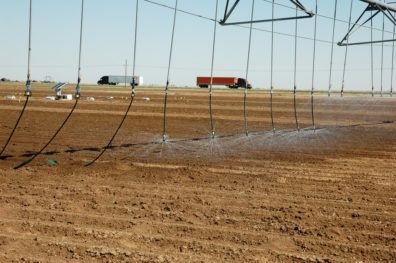 An article recently published in the journal Science lays out the paradox between farm- and basin-level implications of improvements in irrigation technology. This is the latest of several articles (e.g., Allen et al. 1996; Adamson and Loch, 2014) in the last three decades that draw the same conclusion. The article and the importance of this matter inspired me to write this short piece and take a fresh look at the pros and cons of improvement in irrigation technology, with a particular view to its relevance in the Pacific Northwest. Let’s break the question of the benefits of irrigation efficiency down into two questions: Are more efficient irrigation systems beneficial for farmers investing in them? And are such investments advantageous for the rest of society and water-dependent stakeholders such as other farmers? The answer to the first part is generally straightforward and positive: if a farmer switches to a more efficient system, then productivity improves (though there are some complicating factors, that the research team I am a part of discussed in our latest article). However, the second question is more complicated. Here’s why. For years, many countries (including the US) have invested in improving irrigation efficiency. The idea was that improvements in efficiency would reduce demand to divert water for irrigation, and free up some water for other farmers and water-dependent sectors such as fisheries and hydropower producers. In the past, this argument convinced many of us agro-hydrologists to favor more subsidies for improving irrigation technologies as a means of promoting social justice and the welfare of society. Water “leaked” by inefficient irrigation systems rejoins, and can be reused, downstream. Diagram by Keyvan Malek. The article in Science and other past studies argue that, contrary to what seems common sense, more efficient irrigation systems do not necessarily free up water for other sectors, and might actually lead to more water being used, worsening the situation. Higher efficiency often encourages farmers to plant water-intensive crops or increase their irrigated acreage, thereby increasing the consumption of irrigation water. This means that the same farmer who receives the subsidies for improving irrigation efficiency also gets the benefits of the freed-up water. The higher efficiency also leads to a significant reduction in the reusable return flows—“leaked” water that returns to the water supply, being available for use further downstream—that used to be generated by inefficient systems. The bottom line is that the public pays (for the subsidies)—and the public loses (the “extra” water benefits). Grafton and colleagues, the authors of the recent Science article, argue that although this issue has long been an established fact for agro-hydrologists, it has been widely ignored by policymakers in many countries. The main reason is that, “subsidies for Irrigation Efficiency (IE) can promote rent-seeking behavior by beneficiaries who lobby to continue subsidies.” In other words, agencies and companies that provide irrigation services, and farmers that benefit from efficient systems are the ones who lobby for retaining the governmental subsidy programs. The authors offer a solution: tighter water accounting in order to ensure that the freed-up water becomes available to other farmers and water-dependent sectors. 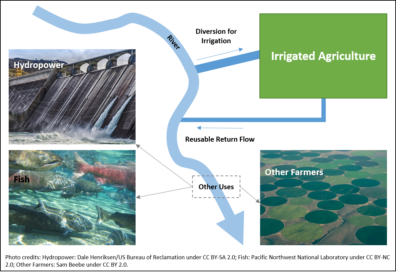 This strategy might include improving remotely sensed observations of water use by crops, employing better measurement devices, buying the return flow, behavioral studies of farmers to find out if they intend to expand their irrigation acreage, or enforcing a cap for reduction of the return flow. Although this article provides an informative discussion of these issues, there are a few additional complications here in the Pacific Northwest that it does not consider. The biggest one, in our mind, is the western water law doctrine of Prior Appropriations, that is based primarily on diversion rights, not consumptive use rights. Under diversion rights farmers have rights to divert a certain amount of water. If they achieve increases in irrigation efficiency, this allows them to consume more of that same diverted water (losing less to evaporation or drainage, for example). This then leaves less water in the watershed for others. So the law does not support efforts to account for the freed-up water, as the farmer still has rights to that water. The good news is that here at WSU, we are looking into the changing irrigation efficiency throughout the Yakima Basin. Our study is gearing up to answer how efficient irrigation technologies and climate change affect various stakeholders of food, energy and water sectors. Stay tuned, and we will share our results in another article in the near future. WSU Team Working on this topic: Keyvan Malek, Jennifer Adam, Jonathan Yoder, Claudio Stockle, Michael Brady, Tina Karimi, Kirti Rajagopalan, Minglian Liu. Allen, R.G., Burt, C., Clemmens, A.J., Willardson, L.S., 1996. Water conservation definitions from a hydrologic viewpoint, in: Proc. North American Water and Environment Congress, ASCE, Annaheim, CA,(CD-ROM). Very informative and thought-provoking essay. I would add indigenous peoples to your examples of water-dependent sectors. Fisheries are not the only issue for this group. Treaty rights to hunt and gather (e.g. the Klamath Tribes’ right to gather wocus, the yellow water lily) are also important. Thanks for bringing this point up. You are absolutely right; tribal interests can also be affected through expansion of efficient irrigation systems and reduction of return flow. I would encourage you to get a water rights permit writer or expert on your team before you invest heavily in your study. Your assumption of the difference between consumptive rights and diversionary rights fails to consider the effects of the beneficial use doctrine in WA water law on diversionary rights. WA water law does differentiate between consumptive and non-consumptive water use under its water rights. Expansion of consumptive use by using conserved water (which is non-consumptive return flow water) from IE to irrigate increased acreage is generally illegal. The post’s author consulted me on your comment, and I thought I’d add a quick response. You are certainly right that it is illegal to expand irrigated acreage based on irrigation efficiency “diversion savings”. This is a very important point that probably should have been made more clear in the post, and it would certainly tend to limit the extent to which irrigation efficiency increases lead to increases in consumptive use. However, I’d hypothesize that there are some subtle ways in which water users might legally make use of their diversion savings that could lead to increases in overall consumptive use, simply by virtue of the complexity and scope of irrigated agricultural systems and the limitations of any statute or court precedent. I’d also argue that water rights holders probably have several legitimate reasons that they might want to pursue these types of opportunities, such as to avoid potential relinquishment threat (however limited) or other potential economic gains. In any case, excellent point.